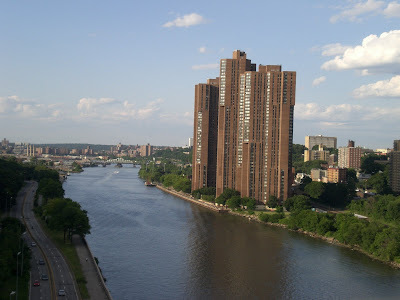 This is a northward view of the Harlem River as seen from the Washington Bridge when crossing from Manhattan into the Bronx. Technically a tidal strait, the 8-mile long Harlem River connects the Hudson and East rivers and forms the northern boundary of Manhattan. 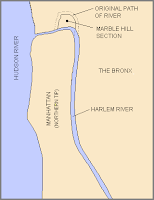 Interestingly, due to the 1895 redirecting of the Harlem River, the Marble Hill neighborhood, now on the Bronx side of the river, is actually within the Manhattan borough limits.